Light up your grill and join us in this journey to BBQ awesomeness, matching your favorite steak with your favorite drink . A super simple marinade recipe that is probably the best thing that has happened to grilled ribeye since the reverse-seared ribeye! When we said that this is a super easy marinade, we weren’t kidding. Just mix a cup of cola with a shot of your favorite whiskey (used in the video: Bourbon whiskey ) and you are ready to soak your rib eye steaks! Let the meat soak in the marinade in a closed container in your fridge overnight. 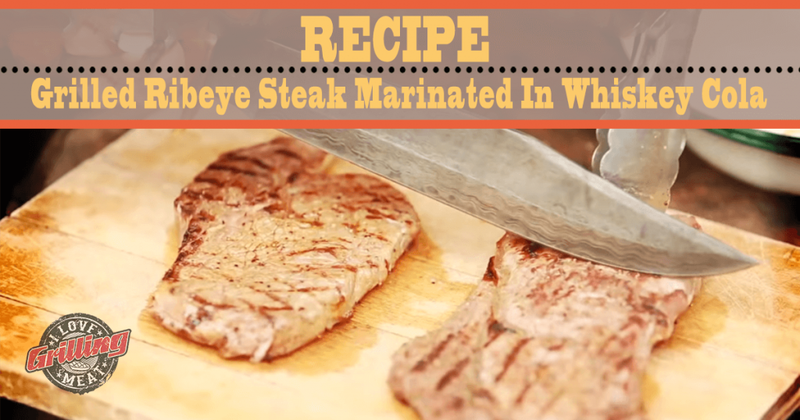 If you want, you can flip it a couple of times along the way to make sure the flavor reaches every inch of the steak. After removing the meat from the marinade, pat it dry with a paper towel. Be sure to discard the marinade juices – don’t drink it, or use it as a mop sauce – it may have picked up bad things from the raw meat! Season the meat with coarse ground salt , black pepper and cayenne pepper . Grill until it has reached your preferred doneness. Let the steak rest for 10 minutes to reabsorb its juices before serving. “The Slav” Deep Fried Burger Recipe Using Ground Ribeye If you’re looking to provide your family and friends with an all-time American favorite with a twist, then check out this version of “The Slav” deep fried burger recipe.